Yesterday we heard that the Time Warner Cable TV application was going to receive a pretty hefty update to include live streaming support for Ice Cream Sandwich devices. Well, the app was updated, but the folks who own rooted devices found that the application does not allow them to stream the live TV that they were hoping for. This shouldn’t necessarily surprise anyone, as most media-centric apps these days block content from rooted users, including Google’s own Movies store. We have seen a user submitted tip that if you wipe the application’s data in your app settings menu, that could clear up the issue. It’s worth a shot, so give it a try if you have been having this trouble and let us know if it works or not. Update: We knew it wouldn’t take too long for a developer to take all of these root device restrictions and throw them out the window. 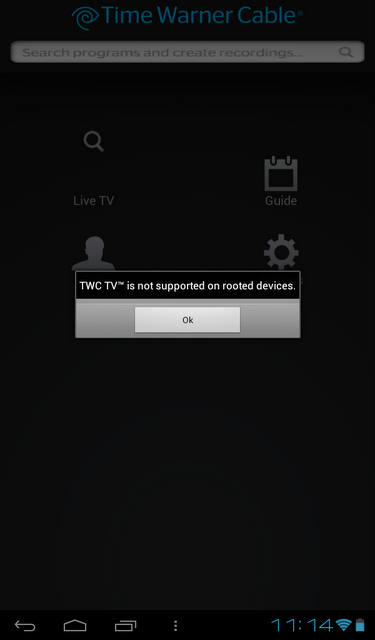 He has released a build of the newest TWC app that has a build.prop fix and removes root access restrictions. You can download the apk and load it as you would any other third party app. Cheers B00sted!